To ensure you don’t miss out on this exciting lesson, please click on the link below to subscribe to my RSS feed or follow me on Twitter or Facebook. 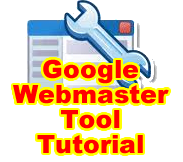 This entry was posted on Tuesday, January 25th, 2011 at 4:38 am	and tagged with central, google, tool, tutorial, webmaster and posted in Free Tutorial, Google Webmaster. You can follow any responses to this entry through the RSS 2.0 feed.